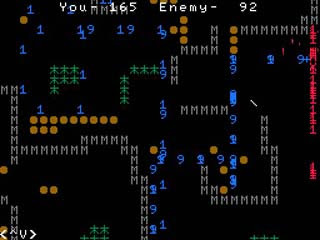 Motnxoqe is a rather clever strategy game of a variety that I don't recall ever seeing before. You have no direct control over the units in your "army", instead placing and removing road blocks on the map with the left mouse button. Any units that encounter an obstacle, either a wall or a roadblock, will turn 90 degrees clockwise and continue on their way. You must guide your army (represented by the blue numbers) to the enemy base and destroy all enemy units on the screen to clear each stage. The key to victory is passing your units through the PI symbols located around the map, which will increase the value of your units and allow them to take out multiple enemy units before before being destroyed. You can shift your view around with the arrow keys or the right mouse button, although I found the mouse technique to be somewhat cumbersome.